Adaptive Delivery from Message Systems has long demonstrated its effectiveness at improving message deliverability to the inbox. And that’s not just blowing smoke—we recently published a comprehensive review of deliverability using eDataSource that proved our platform’s 8% edge in deliverability over the second-place provider. That competitive advantage has a bottom-line impact for our customers, who’ve seen this real-world increase in deliverability when Adaptive Delivery was switched on. Moreover, Adaptive Delivery’s automated traffic shaping—which accounts for real-time changes in receiving domains’ acceptance rates, feedback loops, temporary failures, and bounces—makes a significant impact not only on our customers’ delivery rates but also on their customers’ user experience and brand loyalty. And, of course, these benefits combine to maintain a high domain reputation and further improve overall engagement performance. Administrators have always had the option to receive email notifications when traffic streams are throttled or suspended as part of this traffic shaping process. These critical alerts contain all the information needed to initiate remediation actions, but we’ve heard your feedback that it can be a challenge to wade through and prioritize your efforts when the messages pile up. So, I’m very excited to share that this key feature is getting even better in our upcoming release of Momentum 4.2. 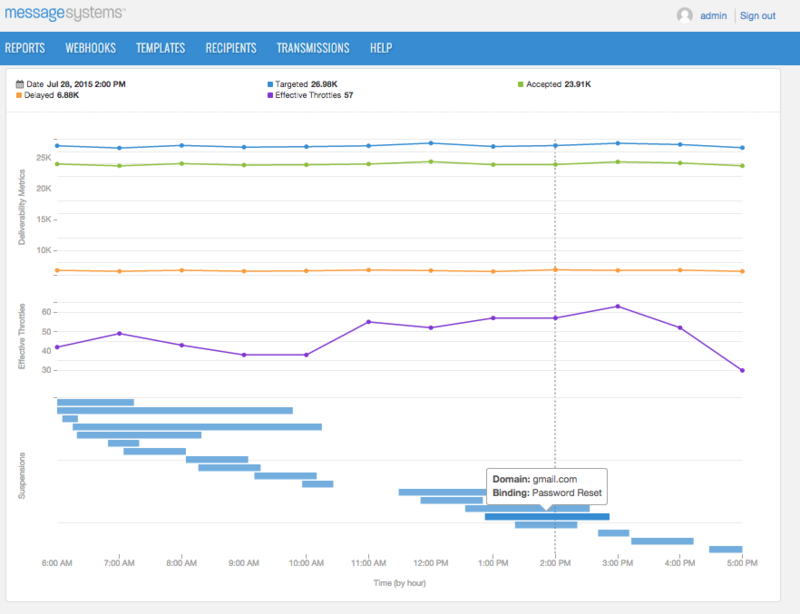 In fact, of the many enhancements we’ve added to this new release, Adaptive Delivery Reporting is one of my favorites. The Adaptive Delivery dashboard, accessed from the Summary drop list, provides a comprehensive summary of all Adaptive Delivery actions in a single view. You are provided key deliverability statistics, complete with exact counts for each data point as you move your mouse over the graphs. Below, you see the number of throttles in effect at any given time, providing an instant insight to the health of your traffic streams. Suspension actions are shown as horizontal bars indicating the duration of the suspension. 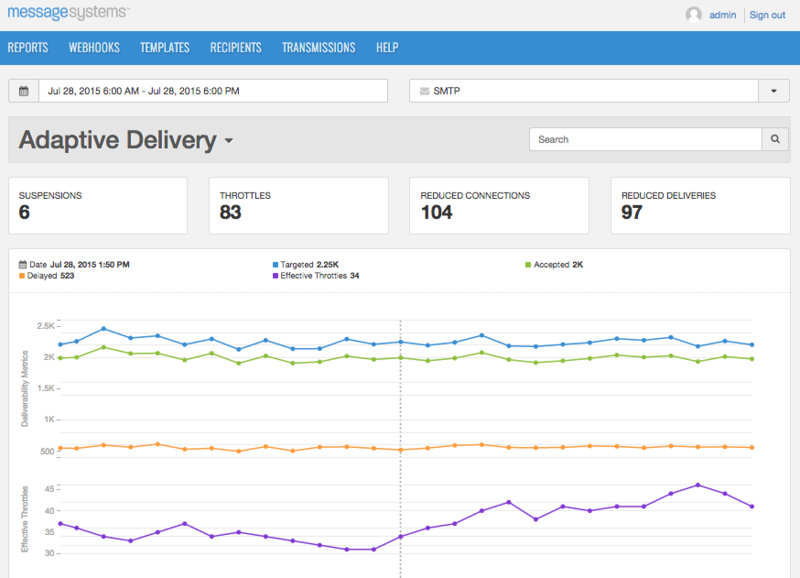 This graph provides instant access to the most critical data for the deliverability manager. Mouse over a suspension bar to get a pop-up, indicating the traffic stream and receiving domain. Click on the bar and the view is zoomed to the time period around the suspension question as shown below. The suspension details are easily found in the Event Details table below. With the domain and suspension trigger info at hand, you are able to quickly move to remediation steps and quickly resolve the problem. The Adaptive Delivery Event Details Table is pretty handy too. A listing for each triggering event is provided with all the data associated with the event. Each of the columns is sortable with the exception of the event type column which can be filtered for suspensions or throttles. Adaptive Delivery Reporting is a great new feature for Momentum 4 administrators. Since the same proven Momentum infrastructure powers SparkPost and SparkPost Elite, customers of those services can rest assured that our deliverability and operations teams already are ensuring optimal message delivery. 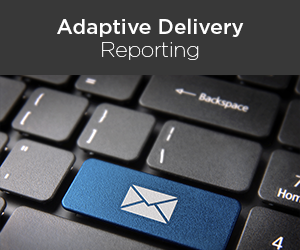 Either way, Adaptive Delivery Reporting is a comprehensive deliverability management tool that will speed your response to the real-time issues that affect message deliverability—and help you to maintain the very highest level of message performance. I think you’ll love it as much as I do.